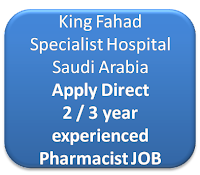 Pharmacist Vacancy at King Fahad Specialist Hospital: Dear pharmacists, King Fahad Specialist Hospital, Dammam SaudiArabia is having vacancy for Pharmacists. 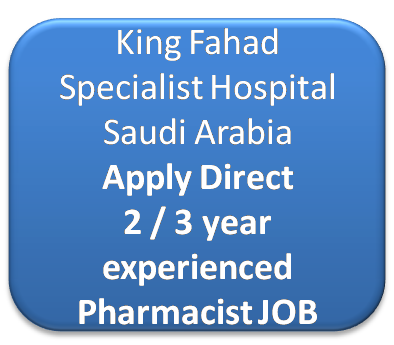 The job profile include to provide Comprehensive pharmaceutical care through integrated drug distribution, clinical services and teaching. Also, fills orders for parenteral and enteral medications, monitor patient drug therapies and provide drug information. They mention major skills as, Two-Three years of Clinical Pharmacy experience, Experience in unit dose, chemotherapy, cytotoxic drugs, TPN, and I.V. Adminixture and experience in a hospital health system. Click here to get all details and apply direct to the job provider.